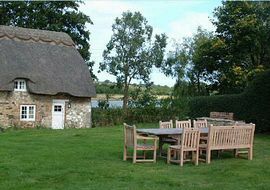 Afton Thatch is a large, detached thatched holiday cottage located at the head of the River Yar, which extends from Yarmouth Harbour, one of England's most unspoilt seaside villages. It is available year round for weeks, short breaks and weekends, sleeping 6-11 in 3/4 bedrooms. 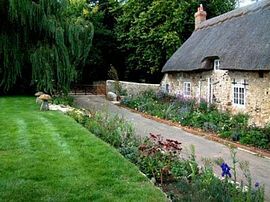 In an area of Outstanding Natural Beauty, the cottage, originally built in 1697, has recently been restored to a very high standard and has been awarded 4 stars by the British Tourist Authority. Tasteful and yet understated, this lovely cottage has been interior designed and features antiques, handmade and upholstered furniture throughout. 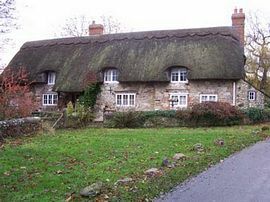 Also available, either seperately or with Afton Thatch, is Afton Thatch lodge, a smaller, recently restored thatched cottage sleeping a couple with children or guests. For a small linen fee beds will be made and towels laid out for your arrival. Well behaved and house trained dogs welcomed. 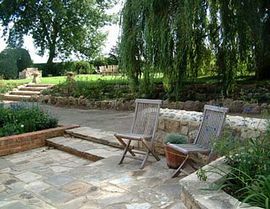 Large professionally landscaped garden with barbeque, orchard with rope hammock, trampoline, occasional croquet/ badminton court, and a summer house with table football. Afton Thatch prices vary from £625.00 in Low Season to £1,875.00 in High Season. Afton Thatch Lodge prices vary from £365.00 in Low Season to £815.00 in High Season. Open year round for weeks, short breaks and weekends.